With no significant bay activity or conditions which could reinvoke the monsoon , rainfall by and large will stay docile over the southern peninsula. The cool easterly breeze coupled with moisture, the fascinating scent of earth’ s reaction to the rain drops, the everlasting beauty of water droplets running down the grass blades. Yes, rain and the beauty it brings along. it appears the curtains of North East Monsoon will roll down without a whimper. Up north, cold and foggy conditions continue to rule the roost and below normal day highs and lows could be the order of the day. 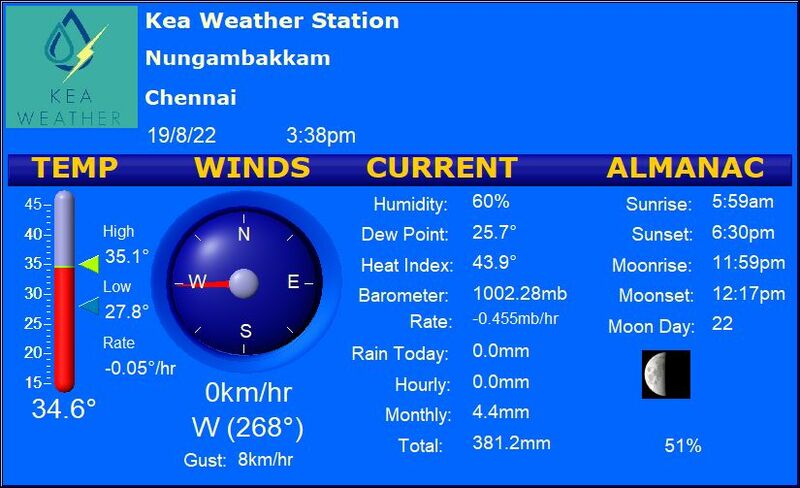 Chennai – Partly cloudy sky with a day high of 29 C.
Madurai – Partly cloudy sky will prevail. Day max will be around 31 C.
Coimbatore – A pleasant day with day high settling around 29 C.
Trichy – Partly cloudy sky is expected and day max will hover around 30 C.
Vellore – A warm day with max around 29 C.